The Indian Army has released a book on 1965 Indo Pak War today. The book, “1965 : Stories from the Second Indo-Pak War” by Rachna Bisht Rawat , is an authoritative narrative in collaboration with the Indian Army to mark fifty years of the historic Indo-Pak War of 1965. Lt Gen KJ Singh, Army Commander Western Command released the book and is published by Penguin Books India. The book includes five key battles from the 1965 war and is extensively researched, with interviews and profiles of war veterans. The book release is part of the celebrations being organized by the Army and the government to mark the occasion of fifty years of the war. Rare pictures of the battles from the Army archives add to the experience of reading the book. 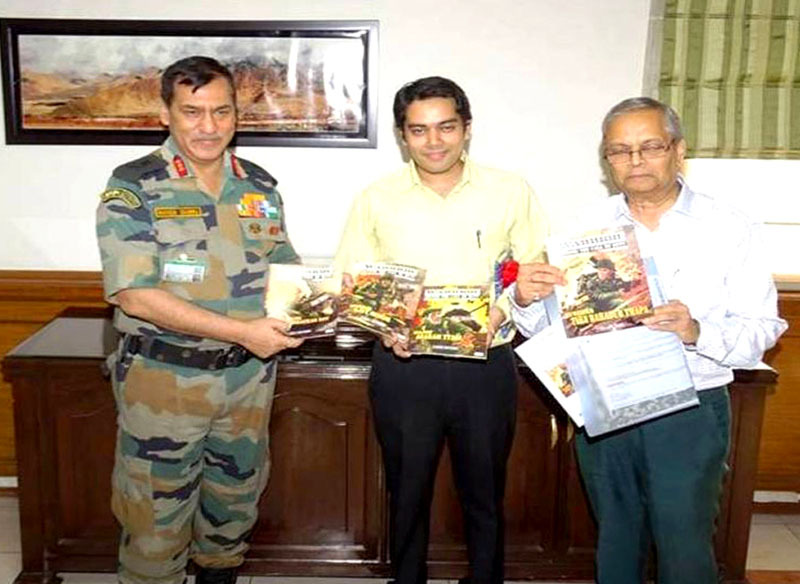 Lt Gen Rakesh Sharma, Adjutant General of Indian Army released a new series of Amar Chitra Katha and Aan Comics today. 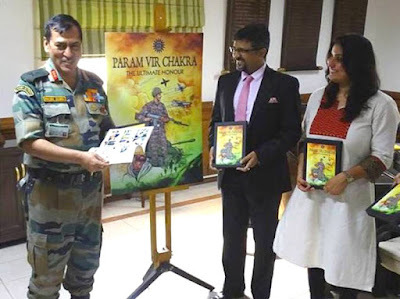 Amar Chitra Katha, India’s favorite storyteller, is presenting a book on inspirational stories of 21 Param Vir Chakra Awardees, as a tribute to the recipients of the highest gallantry award in India. The new 248 page comic narrates inspirational stories of 21 of India’s brave sons who have been awarded India’s highest gallantry award. The all-colour, beautifully illustrated comic tells the story of each hero’s life from childhood to the battle in which they proved themselves victors over incredible odds. Four Aan Comics were also released today based on the heroics of four war heroes who fought in 1965 Indo Pak war and were awarded Maha Vir Chakra. They were Maj Asaram Tyagi, Maj Bhaskar Roy, Sub Ajit Singh and Sub Tika Bahadur Thapa. From the numerous wars on India’s borders, to intervention in military crisis abroad, the soldiers of the Indian Armed Forces have displayed their bravery in the harshest and most alien of conditions. They have battled fearlessly with only one objective in their minds – to fight for their objective and not back down. The PVC is India’s highest military honour; awarded to those soldiers who display the greatest degree of valour and self-sacrifice on the battlefield. The MVC is the second highest gallantry award in India, given to those soldiers who display a very high level of valour & self sacrifice in the face of the enemy. The sensitively portrayed stories in the comics take the readers into the heart of the battles they fought and gives an insight into the lives and minds of some of the most courageous men our country has ever known.